A MAYORAL candidate of the pro-Kurdish People’s Democratic Party (HDP) was detained during a poll office opening in the Ceylanpinar district of Sanliurfa city, located in southeastern Turkey. 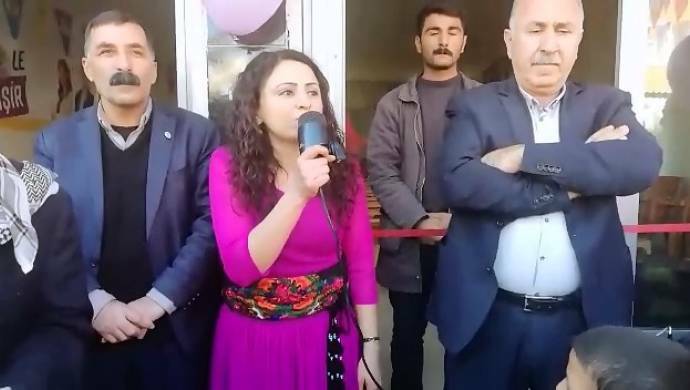 Narin Gezgor, HDP’s mayoral candidate for Ceylanpinar municipality met with her constituents at the opening of her party’s poll office in the city. Mesopotamia News Agency reported that Mehmet Ali Karaman and Narin Gezgor, HDP’s mayoral candidates for Ceylanpinar municipality, were in front of the party building and wanted to march towards where the ceremony will be held. *HDP’nin Ceylanpınar Belediye Eşbaşkan Adayı Narin Gezgör PKK Lideri Abdullah Öcalan üzerinde uygulanan tecride değinince, polis hiçbir uyarı yapmadan kitleye gaz bombası attı. However, police intercepted the group and did not let them march towards their destination. The group split into smaller groups to convene at the opening place afterwards. At the spot, Gezgor started to give her speech HDP members who gathered for the event. Hell broke loose when she mentioned the isolation terms implemented on Abdullah Ocalan, leader of the outlawed Kurdistan Workers’ Party, PKK, the police started charging at the group with tear gas without any warning. Gezgor took shelter in the poll office against the tear gas and was detained on the spot afterwards. “Our mayoral candidate Gezgor was detained in Ceylanpinar, Urfa, at our party’s poll office opening after the police assault her. The government, pursuing to cement fascism, is bound to lose against the freedom struggle of women. Gezgor must be released at once,” read the Twitter post by HDP’s women organization. The imprisoned PKK leader Ocalan has been barred from meeting with any visitors since mid-2016. A fifteen-minute visit from his brother in January was deemed insufficient to call it an end of his isolation by HDP co-chair Sezai Temelli. HDP MP Leyla Guven has been on a hunger strike for three months to protest the predicament of Ocalan and her health is reportedly deteriorating. Authorities removed the elected representatives in the latest municipal elections of 2014, as a part of a crackdown after the coup attempt of July 2016.